Starbucks offer for CFU members! 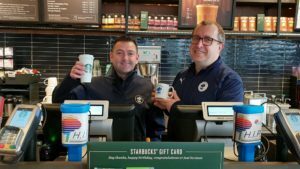 City Fans United and coffee shop giant Starbucks have joined forces to bring CFU members a special discount from now until the end of the season. Starbucks Greyhound Park are offering a 10% discount on all beverage purchases from their store on Sealand Road, on production of CFU membership cards when ordering in-store. It is hoped that this will be the catalyst to further discounts being announced for CFU members, “We would certainly like to invite more businesses to team up with us and offer our 2000+ members a discount on their products and services, and I’m sure many of our members shop both in the City and online. Now is the time to get involved!” said Banks. 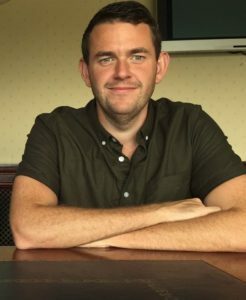 The board of City Fans United can confirm that following the recent resignation of Calvin Hughes, Andrew Morris has now been elected as vice chairman at the board meeting on Monday 7th January. Andrew joined the board in October 2017 and assumes the position with immediate effect. As a reminder, the formal members meeting will take place in the Blues Bar at the Swansway Chester Stadium, next Thursday (17th January) at 7.30pm. The City Fans United board can confirm that Calvin Hughes has resigned from his position as director. Calvin was co-opted back on to the board in January 2018, and was then fully elected at the CFU AGM in September.. He also took over as Acting Secretary following the departure of Tony Allan in August 2018. The board would like to place on record our thanks to Calvin for his hard work throughout his time back on the board, and wish him all the very best in the future. The board of directors would like to wish all members a very enjoyable and safe Christmas. We would also like to thank everyone who has volunteered their time for both CFU and Chester FC – without you, the club could not function. The board really appreciate every single minute of time donated to the club that we all strive to improve, and recognise that at times it may feel that it’s a thankless role, but please be assured that we really would not have a club if it wasn’t for those dedicating their time for the love of the club. 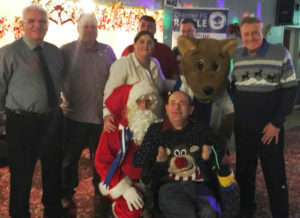 We hope that you all enjoy your festivities and that we will continue to become stronger in 2019 thanks to your efforts volunteering for the club we all love. 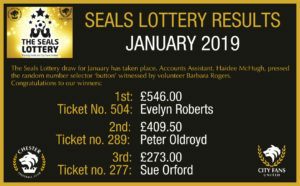 Finally, we would like to thank the management team, players and backroom staff for what they have achieved in 2018, and hope that 2019 will deliver the results that we are all striving for. Today we continue the update from CFU directors, the latest provided Jeff Banks, whose portfolio includes Membership & Fan Engagement. It’s been a manic few months following the efforts of bringing realistic and attractive season ticket and matchday prices to the table, but the Fan Engagement Working Group have ploughed on looking at various aspects of the matchday experience as well as putting our thoughts in to making the CFU membership more attractive to members. We recently hit the 2018 target and have since passed this too, which is great news. Effectively the number from 12 months ago has doubled. 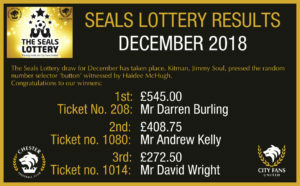 Draw for winner of £20.18 club shop voucher will take place this weekend! We are also going to be looking at further benefits of being a CFU member and also discussing the CFU membership joining fee based on comments and feedback made by members in the Big City Census 2018 and in general. Due to launch in January, a large retailer have offered a generous discount to CFU members, details to follow on this. Buy Clever Stuff have offered CFU members 5% off some ranges and also advised that they will make a further 5% donation to the Squadbuilder fund from purchases made direct from their website. CFU membership had a forecasted budget of £20,000 to hit and we are on course to hit this figure. Extra benefits are being looked at on a continuing basis for life members. 10th November – Altrincham – Remembrance Weekend. Together with the Community Trust, the pre match routine included attendance from the Veterans and Mercian Regiment, and a impeccably observed period of silence to pay tribute. 1st December – Darlington – Retro Day. whilst we didn’t get a crowd of over 2000, which was disappointing, we still managed an increased attendance based on CFC fixtures played on this week in previous seasons. We also believe that there was definitely a feel good factor around the ground with the theme, along with some great sights of fans in their old Chester tops. Whilst financially it didn’t net the club any profit the fact that season ticket holders were able to take advantage of a £5 discount on purchases in the club shop helped produce great figures for the shop on Retro Day. We will keep the thought of having Retro Day 2 in our minds for next season’s planning. Half Time entertainment went down well too, and thanks to Buy Clever Stuff for their help and prizes donations. 22nd December – Telford – Christmas Theme, with Santa making an appearance of course! We are looking at themes for the rest of the season, and will release those in due course, but we are hoping to have involvement from former players, Junior Blues, as well as the Community Trust. This was introduced for the Altrincham match and as mentioned above the Darlington match, and believe that it went down well and will continue to try and provide an enjoyable experience to all watching. Launched Saturday 20th October together with social media marketing and promotional advertising via local press and also a radio advert dedicated to the Cestrian 10 on Dee 106.3 – thanks to Dee for this. We have had more uptake than last season. The initiative now includes Legends Lounge as well as around the ground tickets, and currently offers fans a choice of 10 games from a possible 12. The scheme will end after the Telford match. We are also putting plans together with the Community Trust for remaining unsold Cestrian 10 books. Launched in pre-season, this is in full operation and continuing to work well – we are monitoring the output match by match at present, and all feedback is positive. We also have an additional person helping to respond to questions / promote the App. This was trialled in 2018 for an initial period, however take up was low and would not have been cost effective to continue given the running costs of the platform. FEWG are continuing to look at alternative options for future use. Continuing with the Community Trust. We will look to resume CFU membership applications in March at the Gazebo, although other initiatives may well be progressed via the Gazebo in between times. We have kept in dialogue with Dougherty & Allen to ensure that fans are getting the best experience possible in the Blues Bar and kiosks, following the negative feedback received after the first match of the season. This is to be discussed further in January as we want to progress this to enable a Fan Zone to be set up to allow fans to enjoy the matchday experience further. Dialogue continues with the Safety team. An initial conversation has taken place around the possibility of this being introduced. We are continuing to promote the challenge for members to introduce one new member to CFU. Chester Exiles – FEWG have worked with Bern & Jonno to get a personal message out to the Chester Exiles who potentially feel less involved with our fixtures this season given the geographical nature of this season’s fixture list. FEWG want to ensure that the Chester Exiles are made to feel as inclusive as the rest of the supporters. FEWG to liaise more with the Senior Blues in 2019, to ensure that their group is also getting the best matchday experience too. We are continuing to look at match posters – there are various online posters produced, which are shared across social media. Non online posters are a different kettle of fish, given the costs involved of advertising, although we have tried asking fans to help distribute but this received a low response rate. We are also looking in to the possibility of having an external sign outside the stadium advertising future matches (this in early stages at present). So, as you can see lots going on with the Fan Engagement and Membership section headed up by Guy Lister, and we’re always looking for more members, so if you would like to join our working group then please email fewg@chesterfc.com to become involved.